Because it appears so close to the sun, Mercury can be difficult to locate. 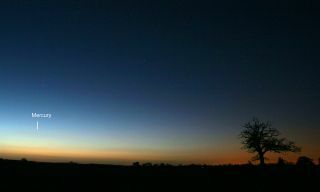 Observers in the Northern Hemisphere can see it close to the western horizon just after sunset throughout the month of March. If there is one thing that has bothered me over my 50-some years as an amateur astronomer, it is the way that most astronomy books give the impression that the planet Mercury is very difficult, if not almost impossible to see. That tendency has, in fact, earned this planet the nickname as the "Elusive Planet." "Mercury is difficult to study because it is a small planet that lies between us and the sun. Most of the time, it is hidden by the sun's glare. It never crosses our night sky, but appears for short periods just after sunset and just before sunrise. It can be seen only if the sky is very clear." For those living in the Northern Hemisphere, just such a "window of opportunity" for viewing Mercury in the evening sky has opened up. In addition, the planet will be close to ;the brilliant Venus, which can serve as a benchmark for making a positive identification of Mercury, the smallest and innermost planet to the sun. Venus will be shining brightly in the evening sky very close to Mercury and can serve as a good benchmark for locating the "elusive planet." As March begins, Mercury literally leaps up into its best apparition of the year for viewers at midnorthern latitudes. Although only 12 degrees from the sun, this little planet shines as bright as minus 1.3 magnitude (practically as bright as Sirius, the brightest star), though it is quite low in the west this month and setting only about 50 minutes after the sun. On each of the next 14 evenings, however, Mercury gets progressively higher and sets a bit later. If your sky is clear and there are no tall obstructions to your horizon view (like trees or buildings), you should have no trouble seeing Mercury as a very bright "star" shining with just a trace of a yellowish-orange tinge. By March 15, Mercury will attain greatest elongation (maximum angular separation) at 18 degrees from the sun. What is notable for observers near latitude 40 degrees north is that almost all of this separation will be vertical: Mercury will stand 17 degrees above the horizon at sunset. For eight days centered on March 15, this rocky little planet will not set until after the end of astronomical twilight, when the sun is between 12 and 18 degrees below the horizon — in other words, when it's a dark night sky. Shining at magnitude minus 0.2 (a trifle brighter than the star Arcturus, in the constellation of Boötes), Mercury will set more than 1.5 hours after the sun, making this the planet's best evening appearance of 2018. As noted earlier, Mercury will keep company with Venus during the first three weeks of March. The two will engage in a sort of celestial "pas de deux," changing position nightly with respect to each other. As March gets underway, Mercury lies just a couple of degrees to the lower right of Venus. Use binoculars to scan the horizon slightly south of due west about 20 to 30 minutes after sunset, and you should be able readily pick out both planets. And once you've sighted them with binoculars, you should be able to sight them with your unaided eyes. On March 3, they will appear side by side, Venus on the left and Mercury on the right. They are closest together the next night, separated by 1.1 degrees. Mercury will then be higher than Venus, poised to its upper right, although it will appear much dimmer, only about one-twelfth as bright as its dazzling companion. During the following week, Mercury will appear to climb higher relative to Venus but will never stray more than 4 degrees from its partner, positioned above and to Venus' right. Then, on the evening of March 18, another visitor will join the scene. A hairline-thin crescent moon, 1.5-days past new phase and only 2 percent illuminated by the sun, will be to the lower left of Venus, while Mercury will appear a similar distance to Venus' upper right: a very pretty celestial tableau! Finally, the denouement: Mercury will drop rapidly and fade quickly, ultimately vanishing into the sunset fires. Mercury, like Venus, appears to go through phases, like the moon. When March began, Mercury's disk was 91 percent illuminated by the sun, imparting the appearance of an almost fully illuminated disk in telescopes. That is also why Mercury starts out the month appearing so bright. Telescopes will show Mercury 43 percent illuminated when it arrives at greatest elongation, and in the following days, its rapidly decreasing phase will result in a dramatic loss in brightness. Whereas the planet burns at minus 0.2 magnitude on March 15, by March 20 Mercury will have faded more than a whole magnitude, to magnitude +0.9, and soon afterward, it will be lost in the bright twilight sky. In fact, just two days later, on the evening of March 22, Mercury's brightness will have dropped to magnitude +1.5, slightly dimmer than the star Regulus in Leo; only one-eleventh as bright as it was on March 1. In telescopes, Venus will appear as a slender crescent phase, 16 percent illuminated by the sun. March 22 will be probably be your last chance to see Mercury. The combination of its lowering altitude, plus its descent into the much-brighter sunset glow should finally render Mercury invisible during the final week of March. The planet will pass through inferior conjunction — between the sun and Earth — on April 1, ending its evening run. It will reappear in late April as a faint "morning star."